There is a fascinating article by Cynthia G. Fox on the subject called Income Tax Records of the Civil War Years. It appears on the National Archives website and is excerpted from the Prologue Magazine Winter 1986 edition, Vol. 18, No. 4. Anna-Karin Schander lives in Sweden and she publishing a podcast in English about Swedish-American genealogy. It will contain both information about Swedish genealogy and history and records and what happened to the Swedes who immigrated mainly to USA (but also to other countries) and the records they left. She includes wonderful old traditional Swedish music as well. The Civil War began at Fort Sumter in Charleston Harbor, South Carolina 146 years ago this week on April 12. 3 million fought - 600,000 died. Chances are someone in your family tree fought in the war. But one thing we know for sure, if you’ve traced any of your family lines back to the 1860s in the US, then you have folks in your tree who lived through and were deeply affected by the Civil War. We’re going to want to learn more about their experience in order to understand their lives. This will lead us to more genealogical leads. Read about the Civil War in the newspapers that your ancestors read. In addition to the newspapers available by paid subscription on Ancestry.com, there’s a terrific free resource! Follow the links to topics of interest. Soldiers The CWSS includes 6.3 million soldier names from the National Archives, which were compiled by NPS' in the CWSS project. As of February, 2000, volunteers in over 36 states had completed the data entry of all the 6.3 million soldier names from 44 states & territories. The two final editing processes for the records have recently been completed. Sailors The NPS and its' CWSS partners are committed to eventually include the names of all Union and Confederate Naval personnel. Given that the records sources for the Navy are not as well organized as the Army records, nor are they micro-filmed, the target date for this is still to be determined. Regiments The CWSS will include histories of over 4,000 Union and Confederate units (regiments), which will be linked to soldiers' names and battle histories. These will be completed this year as part of the CWSS site. The site currently includes regimental histories of units from 44 states and territories. Battles In the CWSS The unit histories are linked to histories of the 364 most significant Civil War battles already on the Internet from the NPS' American Battlefield Protection Program. These battle histories were compiled as part of a report to Congress by the Civil War Sites Advisory Committee. Prisoners The current version of the CWSS includes prisoner records of Union prisoners at Andersonville and Confederate prisoners at Fort McHenry. Cemeteries The National Park Service manages 14 National Cemeteries, all but one of which is related to a Civil War battlefield park. The NPS is planning on listing all names of burials in these cemeteries on the Civil War Soldiers and Sailors System. The first phase involves data taken from written records of Poplar Grove National Cemetery at Petersburg National Battlefield, and also includes images of the headstones. Medal of Honor This feature of the CWSS includes information on over 1,200 Civil War soldiers and sailors who received the Congressional Medal of Honor. NEW STORIES - The National Park Service Civil War Institute – Stories of the Civil War addresses the social, economic, political & military aspects of the war. EDUCATE – for teachers providing civil war curriculum materials from national parks & lesson plans on building a family history. Song: “Hello, Frisco!” By Harvey Hindermeyer, a 1915 wax cylinder recording by The Edison Co.
101 years ago, on April 18, 1906 at 5:13 am an earthquake nearly 8.0 on the Richter Scale hit San Francisco. A slip in the San Andreas Fault caused Shock waves up and down the Pacific Coast. Hundreds Died. Fires did the most damage. My Great Grandma was 7 months pregnant with my maternal grandfather when the quake struck. They were living at on Kentucky St., in the city at that time, and I can’t imagine what she must have gone through. 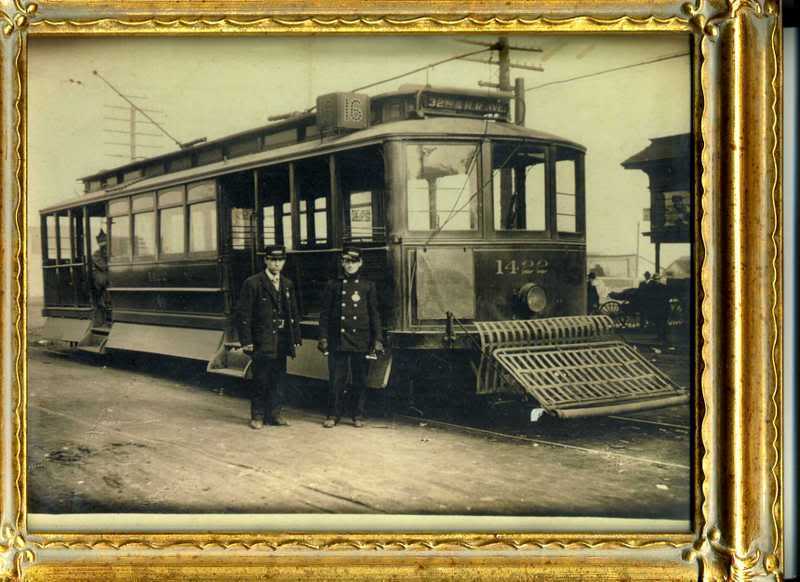 In 1906 my Great grandpa worked as a motorman on a cable car. Shortly after the earthquake he went into a very sensible new career – Life Insurance Salesman! Originally Gladys focused on the 1906 Earthquake Dead using the death dates between April 18, 1906 - May 19, 1906. However with the Governor's Earthquake Task Force now defines an earthquake death as "… an immediate fatality resulting from an earthquake or an earthquake-caused injury or illness that becomes fatal within a period of ONE YEAR following the earthquake." This dramatically broadens the scope of the research. Gladys and her team are now embarking on an effort to compile an accurate account of those affected by the 1906 earthquake. This time they are looking for information on everyone who was in San Francisco at that time, not just those who died. They consider all stories. Census – Find neighbors and do a quick Google & Ancestry search on them. YouTube.com (see Episode 4 for more info on using YouTube) Lisa's playlist on YouTube.